Chi Running: Can Running be Effortless? Chi running makes a big promise to its followers. You can run effortlessly! As the women above knows, most running doesn’t feel effortless. I am usually a sweaty mess after I finish my training runs – and I sleep well that night! 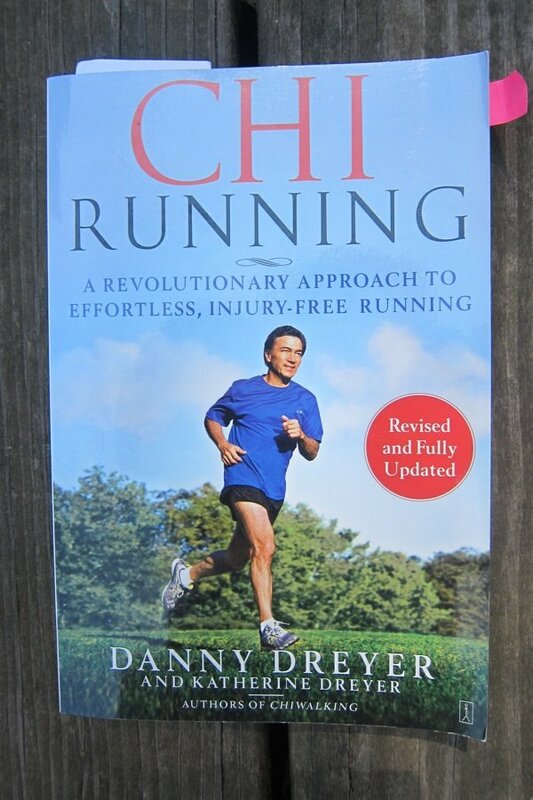 Danny Dreyer developed Chi Running after studying Tai Chi. Tai Chi is a Chinese martial art and you may have seen people practicing it. Typically, they look like they are in slow motion, moving back and forth pushing their hands in the air. They seem to move like liquid. The basic Chi Running concept is that you want to run in harmony with the laws of nature – in balance and in flow. You are supposed to FOCUS YOUR MIND on proper technique (which he explains in his book) and relaxing your legs. I came upon Chi Running during my sprint triathlon training. My running career had consisted of Couch to 5K in 2015 followed by my first 5K. I was amazed that I could train for a race and complete it! But, I didn’t like running at all. I blasted music in my ears to keep me going and RUNNING HURT! I loved how I felt after a workout so I kept at it but I didn’t progress in my running. I kept finishing 5Ks but not faster or noticeably stronger. I decided that I needed to do something different with my running and Chi Running was a technique that immediately appealed to me. I like anything that says it is “effortless”. You are to go with the flow by using gravity to help propel you forward. Instead of powering through, you relax and allow your body to fall gently forward – then you catch it – and in doing so you start running. You take small steps and listen to your body. Danny Dreyer is convinced that running is a practice like yoga that will help you clear your mind and RELAX. He got me with those two words: practice and relax. I was doing the opposite with running. I did not consider it a practice (it was a chore) and relaxation happened at the end but not during the run. During the run, I was tense. At any rate, Chi Running appeals to me. Every once in a while, I feel like I am getting it – and I get the effortlessness of it. I flow with the universe (and I am running at the same time). If nothing else, trying to relax during running has helped me like running more. Maybe, just maybe, I could become a runner that can’t wait to lace up her shoes and hit the pavement. There is also a book for the walkers in the group called Chi Walking. Have you ever thought about your form while walking? Do you ever get injured or feel pain? I think this could help but I haven’t tried it. Have you tried Chi Running or Chi Walking? What do you think of it? Does it work for you? I, too, like the exhausted, satisfied feeling I get after running but don't love the act itself. I love the concepts of 'practice' and 'relax.' What a great way to reframe my thoughts on running. Thank you Snack Girl! Makes me think of the state of more-or-less effortless running I was able to achieve in my late twenties / early thirties, when my mind really went somewhere else during the run. It was bliss! At this point I'm a walker and will check out Chi walking. Thanks, Lisa, for always bringing new ideas to the table!